Alarmed by the threat of a nuclear war between the U.S. and North Korea, concerned U.S. peace groups have come together to send an open message to Washington and Pyongyang that we are strongly opposed to any resumption of the horrific Korean War. What we want is a peace treaty to finally end the lingering Korean War! Inspired by the Vietnam-era People’s Peace Treaty, we have initiated a People’s Peace Treaty with North Korea, to raise awareness about the past U.S. policy toward North Korea, and to send a clear message that we, the people of the U.S., do not want another war with North Korea. This is not an actual treaty, but rather a declaration of peace from the people of the United States. Our goal is to collect many thousands of signatures, and to publicize the People's Peace Treaty to the people in the U.S. as well as in the rest of the world. 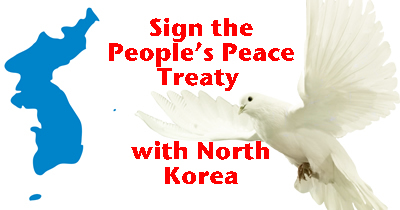 Please add your voice for peace by signing the People’s Peace Treaty with North Korea. Click below to add your name, and scroll down to find the names of prominent signers. Convinced that ending the Korean War officially is an urgent, essential step for the establishment of enduring peace and mutual respect between the U.S. and the DPRK, as well as for the North Korean people’s full enjoyment of their basic human rights to life, peace and development – ending their long sufferings from the harsh economic sanctions imposed on them by the U.S. Government since 1950. 28911 6 days ago Anonymous New York, NY , US This is awesome information of website architecture…Thanks for sharing. 28910 6 days ago Anonymous New York, NY , US This post are very useful one.It is great to see this blog.Thank you for sharing this. 28909 6 days ago Anonymous New York, NY , US Really nice and informative post shared here.Thanks for sharing. 28895 3 months ago Elaine Pawlak Chicago, IL , US I join hands , with the people of North Korea and all people on Earth, in peace. By taking action you agree you may be emailed by Nuclear Age Peace Foundation, RootsAction, or World Beyond War. We consider your contact information to be private and confidential. We will NOT disclose it to any other entity unless you specifically authorize us to do so. You can unsubscribe at the bottom of any email you receive from us.